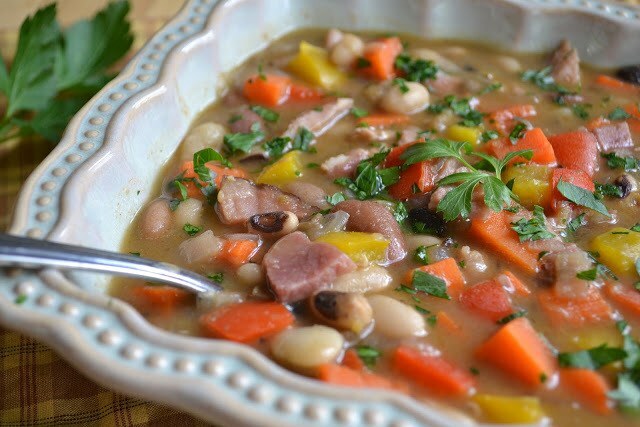 Cajun Ten Bean and Ham Soup is bursting with colorful flavor and hearty nutrition! Turn leftover ham into a meal everyone loves! Heat the oil in a large heavy bottomed soup pot and saute the onion for a few minutes. Add in the herbs and spices, ham bone and 8 cups water. Bring up to a boil. Turn off the heat, cover, and let sit for an hour. Bring the soup back up to a simmer and cook until the beans are tender. Add in the carrots and peppers. If you like a thicker soup, sprinkle in some quick dissolving flour, like Wondra, until you get it as thick as you want it. It will continue to thicken as it cools, so don't overdo the flour. At this point I like to let the soup cool and then refrigerate until ready to eat. This gives the soup time to develop some extra flavor. Reheat the soup add the parsley right before serving.